Microgrids have a long history. In fact, Thomas Edison’s first power plant constructed in 1882 – the Manhattan Pearl Street Station – was essentially a microgrid since a centralized grid had not yet been established. By 1886, Edison’s firm had installed fifty-eight direct current (DC) microgrids. However, shortly thereafter, the evolution of the electric services industry evolved to a state-regulated monopoly market, thus removing incentives for microgrid developments. Today, though, a variety of trends are converging to create promising markets for microgrids, particularly in the United States. It has been become increasingly clear that the fundamental architecture of today’s electricity grid, which is based on the idea of a top-down system predicated on unidirectional energy flows, is obsolete. AAccording to GTM Research’s report, North American Microgrids 2015: Advancing Beyond Local Energy Optimization, cumulative investments in U.S. microgrids from 2015 through 2020 will surpass $3.5 billion. By then, the U.S. will be home to an estimated 2.8 gigawatts of total microgrid capacity, a 127 percent cumulative capacity increase relative to 2015 numbers. Technological improvements in gas turbines have changed the economics of power production. It isn’t necessary anymore to build a 1,000- megawatt generating plant to exploit economies of scale. Combined-cycle gas turbines reach maximum efficiency at 400 megawatts, while aero-derivative gas turbines can be efficient at scales as small as 10 megawatts. Renewables can power microgrids more cost effectively now too. Most existing power plants, central or distributed, deliver electricity to user sites at an overall fuel-to-electricity efficiency in the range of 28-32%. This represents a loss of around 70% of the primary energy provided to the generator. To reduce this energy loss it is necessary to either increase the fuel-to-electricity efficiency of the generation plant and/or use the waste heat. Combined power cycles technology can attain efficiencies approaching 60% with ratings in the hundreds of million watts. On the other hand if the waste heat from generators with much lower efficiency (28-32%) can be utilized through heat exchangers, absorption chillers or desiccant dehumidification the overall fuel-to-useful energy efficiency can be higher than 80%. Today we talk about energy “distribution,” from central power plants down to light bulbs, which is slightly different from having distributed energy, much of which is not on the grid, like standalone PCs used to be. In a Smart Grid, energy is more likely to be exchanged than distributed. In this new topology, the grid become more peer-to-peer, more multi-vendor, with more standards, and more competition. The transmission of energy then becomes more networked, and more symmetrical, more among than between. Radios and TVs are being replaced by mobile devices, which upload, not just download. The same holds true in energy grids. DISCO – Distribution Company - Local distribution monopoly. 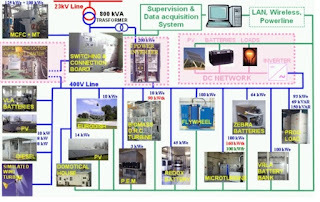 Island – A portion of a power system that is electrically separated from the interconnection due to the disconnection of transmission system elements. Islanding - The ability of distributed generation to continue to generate power even when power from a utility is absent. There were approximately 20 microgrids can be found at universities, petrochemical facilities and U.S. defense facilities ;provding 785 MW of capacity in 2005. ; ;Outside of the petrochemical microgrids, there are no commercial microgrids in the United States. Most current microgrid implementations combine loads with sources, allow for intentional islanding and try to use the available waste heat. Microturbine - Microturbines are an important emerging technology. They are mechanically simple, single shaft devices with air bearings and no lubricants. They are designed to combine the reliability of commercial aircraft auxiliary power units with the low cost of automotive turbochargers. The generator is usually a permanent magnet machine operating at variable speeds (50,000-100,000 rpm). This variable speed operation requires power electronics to interface to the electrical system. Peer-to-Peer Concept - Insures that there are no components, such as a master controller or central storage unit that is critical for operation of the microgrid. This implies that the microgrid can continue operating with loss of any component or generator. With one additional source (N+1) we can insure complete functionality with the loss of any source. Plug-and-Play - Implies that a unit can be placed at any point on the electrical system without reengineering the controls. Plug-and-play functionality is much akin to the flexibility one has when using a home appliance. That is it can be attached to the electrical system at the location where it is needed. The traditional model is to cluster generation at a single point that makes the electrical application simpler. The plug-and-play model facilitates placing generators near the heat loads thereby allowing more effective use of waste heat without complex heat distribution systems such as steam and chilled water pipes. Power Loop – Automatically isolate faults and reroute power flows from either direction. UDM - Utility Distribution Microgrid - Utilities across the United States are UDM's in order to explore new market opportunities in the emerging distributed energy resources (DER) landscape. Previously opposed to the concept of intentional islanding, utilities are now exploring microgrids thanks to recent technology advances such as smart inverters, smart switches, and new DER control platforms. Rather than being focused on providing economic value and resiliency benefits to behind-the-meter customers, UDMs can enable utilities to manage DER portfolios to bolster reliability at the distribution level of power service. In 2015, 29 MW of new UDM capacity was deployed across the United States, representing an estimated $161 million in implementation revenue. By 2024, those numbers are expected to increase to 241 MW annually, with corresponding annual revenue of $917 million. 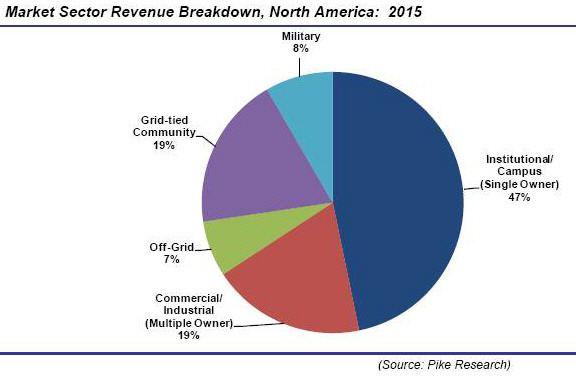 Microgrids operated/owned by utilities can serve the distribution grid first (and be a platform for new services). UDMs can also be seen as vehicles to help utilities address DER deployment trends to their advantage. Yet, UDM adoption is dependent upon regulatory reforms, natural disasters, and customer adoption rates of DER such as solar PV and energy storage. As such, UDMs will only be deployed for a very small portion of the broad addressable market over next decade. Pilot Microgrid - ;CESI RICERCA DER ;Constituted by several generators with different technologies (renewable and conventional), controllable loads and storage systems. DER-TF can provide electricity to the main grid with a maximum power of 350 kW. The goals of both the smart grid and the microgrid are the same: to maximize generation assets through embedded intelligence while dramatically boosting efficiencies, thereby minimizing costs. However, they appear to offer two potentially different paths forward. Both “supergrid” and “microgrid” will need to get smarter, though it is the distribution system that is currently the prime source of outages and unreliability. Today’s distribution grid network is clearly inadequate to support the type of innovation now occurring with distributed resources, including devices such as plug-in hybrid electric vehicles (PHEV) serving as distributed storage batteries. The question is: Do we need bottom-up or top-down innovation? The smart grid will seamlessly integrate an array of locally distributed power resources, including clean renewable solar sources and storage in quantities far beyond what is possible with today’s power system. This plug and play capability will enable consumers to supply as well as purchase power. Application of individual distributed generators can cause as many problems as it may solve. A better way to realize the emerging potential of distributed generation is to take a system approach which views generation and associated loads as a subsystem or a “microgrid”. In this model it is also critical to be able to use the waste heat by placing the sources near the heat load. This implies that a unit can be placed at any point on the electrical system as required by the location of the heat load. A utility determines that an electric island (microgrid) could be intentionally established and dispatches electric storage as well as other DER generation and load management capabilities to support this islanding. Europe has a whole lot more loops than radial runs in their transmission system compared to the US which provides redundancy. ; A microgrid is an attempt to make a radial feed look more like a loop. Control systems fall into two major camps. The purists – epitomized by the CERTS software – believe that microgrids should operate without any central command and control system, with generators and loads harmonizing autonomously based on local information. This is the view espoused by leading academics and localization advocates and the rationale is compelling. This system will work for the majority of smaller microgrids with a single owner and whose top priority is reliability and sustainability during emergencies. These are the “dumb” microgrids, if you will. There are also those systems that can straddle these two views. There are few clear cut direct competitors in the space since no standards exist and microgrids are so modular, diverse and optimize such a broad array of energy-related services. It is these control systems – still literally being defined – where the fiercest competition may reign within the microgrid space. 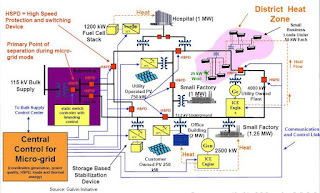 This is the guts of the microgrid, if you will, and the focus of current software innovation. 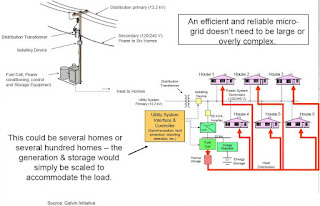 The Federal Energy Regulatory Commission’s (FERC) March 2011 ruling (Order 745) mandating a demand response (DR) market by authorizing Independent System Operators (ISO) to compensate these distributed resources on par with generators is a game changer and will only accelerate the growing marriage of supply and demand resources within and outside of microgrids. This ruling could transform microgrids from threats to local distribution utilities into valuable resources for the larger grid. The FERC ruling’s primary impact is on energy service provision and less so on capacity and ancillary service offerings. Each ISO/RTO filed its demand response compensation tariffs in July 2011, but for all practical purposes, it will not be until summer 2012 that this new revenue stream will be available to demand response providers. Significant barriers remain for microgrids to be considered a standard option for adding new capacity and other energy-related services across global markets. Nevertheless, there are certain application segments located within specific geographies where microgrids can make economic sense. Sometimes these deployments depend on government incentives or other sources of supplemental funding. Yet the number of microgrids that are being deployed without the help of government grants and incentives is growing. The largest microgrid market today is Asia Pacific, displacing North America for the first time. By the end of the 10-year forecast, these two regions are expected to switch places, with North America in the lead again. 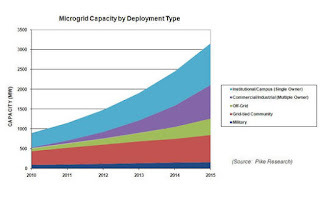 According to a study by Navigant Research, global microgrid capacity is expected to grow from 1.4 GW in 2015 to 7.6 GW in 2024 under a base scenario. 4. Key Opportunities for Microgrids Each microgrid market segment – whether a commercial building cluster or a remote community – is characterized by different priorities. Within the federal government sector, and especially in the case of military bases, islanding for reliability purposes is paramount. For commercial institutions, islanding may still be important, but the buying and selling of services from onsite generation or aggregated demand reductions to the distribution utility is often more important. Military Bases – The Defense Department has become a leading proponent of installing microgrids. ;In 2008, a ;task force recommended DoD launch a comprehensive program to reduce the risk to critical missions at fixed installations from loss of commercial power and other critical national infrastructure. It suggested that the Department should take immediate actions to “island” critical installations and increase the efficiency of critical equipment to reduce the burden for backup systems. Currently the smallest market segment, these microgrids are just now being developed. They are integrating Renewable Distributed Energy Generation (RDEG) as a way to secure power supply without being dependent on any supplied fuel. In 2009, General Electric received a contract to work with the Department of Defense in a $2 million project to transform the Twentynine Palms Marine Corps base into a model smart microgrid system. The vast Twentynine Palms Base in California houses the Marine Corps Combat Center. The Corps' premier site for training exercises occupies 932 square miles in the southern Mojave Desert, an area about the three-quarters the size of Rhode Island. ;Like most U.S. military bases, Twentynine Palms generates power on site to cover critical needs -- it has a solar plant as well as a fuel cell installation -- and is connected to a larger electrical grid network, the California grid. GE plans to design a system for the base that features a suite of microgrid control technologies. The system is intended to serve as a showpiece of smart energy management for deployment of microgrid technology in general and, more specifically, for military bases. University Campuses - Because of the advantage of common ownership, this class of microgrids offers the best near-term development opportunity. At present, 322 MW of college campus microgrids are up and running in the United States, with more sophisticated state-of-the-art microgrids on the drawing boards. In the U.S., 40% of future microgrids will be developed in this market segment, adding 940 MW of new capacity valued at $2.76 billion by 2015. Industrial Campuses - ; The first “modern” industrial microgrid in the United States was a 64 MW facility constructed in 1955 at the Whitling Refinery in Indiana. All told, 455 megawatts (MW) of these vintage microgrids are currently online in the United States. Unlike today’s conceptual state-of-the-art models, these initial designs for the petrochemical industry still feature centralized controls and fossil-fueled generation sets. Japan is a modern leader in the commercial/industrial sector, though most of its microgrids include governmental and other institutional customers. For example, in March 2011, plans for an ambitious multi-faceted energy and research park in northern Colorado have been approved by local county commissioners. The 640-acre project, Niobrara Energy Park, will include natural gas and renewable energy generation plants with onsite storage, cloud computing data centers and facilities for scientists, institutions, engineers and others to research energy systems integration, renewables, smart grid and energy storage. Cities with 25-75,000 population - Most observers predict that this class of microgrids will not achieve widespread commercial acceptance until standards are in place and regulatory barriers are removed. Jails and Prisons - An $11.7 million microgrid project designed and built by Chevron Energy Solutions will mean Santa Rita Jail in California's Alameda County can sustain power for daily operations and security if its connection to the grid is interrupted. The jail's onsite power generation integrates with energy storage to ensure power is never lost. The microgrid also allows the jail to buy power from the utility during least expensive nonpeak hours and store it for use during the most expensive summer peak hours, which provides significant savings. In fact, the county anticipates it will save $100,000 per year in energy costs at the "mega jail" which covers 113 acres and houses as many as 4,000 inmates, making it the fifth largest such facility in the country. The Santa Rita Jail requires 3MW of constant, reliable electricity to maintain daily operations and ensure the safety of the inmates and staff. The microgrid initiative is the culmination of several renewable energy projects implemented at the jail, including solar photovoltaic panels, a 1MW fuel cell cogeneration plant and wind turbines, along with a 2 MW advanced energy storage system. The project was funded in part by the Department of Energy, the California Energy Commission and the California Public Utilities Commission. Remote locations - This segment represents the greatest number of microgrids currently operating globally, but it has the smallest average capacity. While many systems have historically featured diesel distributed energy generation (DEG), the largest growth sector is solar photovoltaics (PV). Small wind is projected to play a growing role,as well. The United States is the current capacity leader – with at least 626MW operating by 2010 – and Pike Research estimates that capacity will increase to 2,352MW by 2015. Two of the fastest growing segments in this market are the Commercial & Industrial and Institutional/Campus sectors. Manage Distributed Energy Resources - See my DER Blog Article Microgrids could help utilities use distributed power generation systems like solar panels on customers’ rooftops in a far more effective way. Application of individual distributed generators can cause as many problems as it may solve. A better way to realize the emerging potential of distributed generation is to take a system approach which views generation and associated loads as a subsystem or a “microgrid”. Avoided Transmission Investment - This, in turn, could help them cut back on the need for a massive investment (and permitting nightmare) in building lots of new high-voltage transmission lines to carry renewable power from far-off wind farms and utility-scale solar plants to towns and cities. Locally-based solar, wind, biomass generators, fuel cells and other distributed generation systems would be much more convenient sources of power, and would cut down on the line losses associated with long-range transmission to boot. But right now, distributed generation systems are more of a headache than a help for most utilities, since utilities can’t control the way those resources put power onto the grid. Flexibility - Traditional Power Flow Model with AMI and Automated Switching only one switch may be open, and power always flows the same direction depending upon configuration. In a Microgrid, more than one of switches A through E can be open simultaneously without outages due to distributed generation. Power flow direction is variable. Innovation - ;According to SBI Energy, microgrids will become the incubator and operational test bed for innovative smart grid solutions and vendors since it is significantly less difficult and costly to deploy smart technologies. Critical Systems Resiliency - Everything is interdependent. For example, if vital communications go down, other sectors falter, but if sensitive equipment is powered locally, our vulnerable, centralized power system becomes much less critical, and is a less attractive terrorist target. Islanding – The ability to separate and isolate itself from the utility’s distribution system during brownouts or blackouts. Under today’s grid protocols, all distributed generation, whether renewable or fossil-fueled, must shut down during times of power outages. This fact exasperates microgrid advocates, who argue that this is precisely when these on-site sources could offer the greatest value to both generation owners and society. Such sources could provide power services when the larger grid system has failed consumers and owners of distributed energy generation systems. Utility engineers have historically opposed the concept of islanding on the basis of safety and lack of control of their own power grids. The standard line was that unintentional islanding endangered the lives of crews working to restore power. Today, however, a host of new power conversion inverter technologies have convinced the Institute of Electrical and Electronics Engineers that little islands of self-sufficient microgrids are no longer a threat to either workers or to the utility grid in general. During disturbances, the generation and corresponding loads can separate from the distribution system to isolate the microgrid’s load from the disturbance (providing UPS services) without harming the transmission grid’s integrity. This ability to island generation and loads together has a potential to provide a higher local reliability than that provided by the power system as a whole. Reliability -Another element of fault tolerance of smart grids is decentralized power generation. Distributed generation allows individual consumers to generate power onsite, using whatever generation method they find appropriate. This allows individual loads to tailor their generation directly to their load, making them independent from grid power failures. Efficiency - Increase energy efficiency while reducing the need for new, expensive large centralized power plants and their power delivery infrastructure. Smart microgrids can also take advantage of waste heat from local distributed power generation to heat and cool buildings thus doubling the overall efficiency of the power generation. Self-Sufficiency - Bottom-up electrification initiatives are emerging in the developing world. These are proving to be particularly efficient and cost-effective entry level approaches. Resiliency - It is a decade from now. An unusually destructive storm has isolated a community or region. Ten years ago, the wait for the appearance of a utility’s “trouble trucks” would begin. The citizens would remain literally in the dark, their food spoiling, their security compromised and their families at risk. Instead, with full microgrid deployment, this future community is not waiting. Instead, it’s able immediately to take advantage of distributed resources and standards that support a Smart Grid concept known as “islanding.” Combining distributed resources of every description – rooftop PV (solar), fuel cells, electric vehicles – the community can generate sufficient electricity to keep the grocery store, the police department, traffic lights, the phone system and the community health center up and running. While it may take a week to restore the lines, the generation potential resident in the community means that citizens still have sufficient power to meet their essential needs. Compatibility - Microgrids are completely compatible with the existing centralized grid, serving as a functional unit that assists in building out the existing system, helping to maximize otherwise stranded utility assets. Legal Prohibition - One of the most significant barriers to smart microgrids is the legal prohibition against private electric lines crossing public streets. This ban is a result of the 20th century argument that consumers are best serviced by giving one organization an electricity distribution monopoly in each geographic service areas. Regulation - Cross-jurisdictional Issues between federal and state regulators: FERC, NERC, Public Utility Commissions. Complexity - Microgrid solutions rely on complex communication and control and are dependent on key components and require extensive site engineering. What is needed is to provide generator-based controls that enable a plug-and-play model without communication or custom engineering for each site. Merging Power and Industry - As more customer-centric applications like real-time pricing, distributed generation and micro-grids are deployed; utilities must take more of an interest in the industrial automation world. What was previously a one-way relationship must become a partnership as customers become active contributors to the operation of the power system. Development of technology, tariffs, regulations, standards and controls to balance dynamic supply and demand. Voltage Regulation for local reliability and stability. Without local voltage control, systems with high penetrations of micro-sources could experience voltage and/or reactive power oscillations. Distributed Generation - A necessary precursor to establishing microgrids is the creation of networks of rooftop solar, small turbine, battery storage, and other related technologies. Without distributed generation and storage capabilities, the microgrid can not survive independent of the national grid. Stafford Hill Solar Farm - In August 2014, Green Mountain Power (GMP) broke ground on a solar plus energy storage microgrid in Rutland, Vermont with one expert calling it a "perfect" project. The 2.5-MW Stafford Hill solar project is being developed in conjunction with Dynapower and GroSolar and includes 4 MW of battery storage, both lithium ion and lead acid, to integrate the solar generation into the local grid, and to provide resilient power in case of a grid outage. The companies said that this project is one of the first solar-only microgrids in the nation, and the first to provide full back-up to an emergency shelter on the distribution network. “Solar power and battery storage will provide clean reliable power to a school that serves as an emergency shelter, helping a community cope with loss of power in a future disaster,” said Lewis Milford, president of Clean Energy Group, which manages the Clean Energy States Alliance. The energy storage component of this project is co-funded by a federal-state-NGO partnership involving the State of Vermont; the U.S. Department of Energy, Office of Electricity; and the Energy Storage Technology Advancement Partnership (ESTAP), a project managed by Clean Energy States Alliance and Sandia National Laboratories. Cost recovery for this project will come largely through services to the grid. During non-emergency periods, the energy storage is simply there to make the grid smoother. The project will help further the discussion on how utilities will value grid resiliency and how to monetize emergency services. Frequency regulation has now become a commercially viable business, not only because it has been demonstrated to work technically but also because FERC realized its value. Developers estimate that frequency regulation with energy storage is valued a roughly twice what frequency regulation is when it's done with fossil fuels. Clean Coalition - The Hunters Point Community Microgrid Project is the flagship Community Microgrid project and is being conducted in collaboration with Pacific Gas & Electric. It is designed to transform the Bayview and Hunters Point areas of San Francisco into a world-class Community Microgrid. The Hunters Point Community Microgrid Project, named after the substation that serves the area, showcases how a utility can deploy higher levels of local renewables to secure economic, energy, and environmental benefits for its customers. The Hunters Point Project also demonstrates that the technologies and methodologies required to deploy Community Microgrids are readily available today. Once deployed, the Hunters Point Community Microgrid Project is expected to bring $100 million in local wages to the Bayview-Hunters Point community, while reducing greenhouse gas emissions by 1.5 billion pounds over the next 20 years. Hunters Point Community Microgrid Project Benefits Analysis (update coming soon). CERTS - DOE's Consortium for Electric Reliability Technology Solutions ; ;- Program Office run by Lawrence Berkeley Labs- Formed in 1999 to research, develop, and disseminate new methods, tools, and technologies to protect and enhance the reliability of the U.S. electric power system and efficiency of competitive electricity markets. CERTS was piloted at the Sacramento Municipal Utility District(SMUD)’s corporate headquarters. Developed with help from the California Energy Commission and the University of Wisconsin, newly developed software and “smart” switches allows all generation sources and appliances and other “loads” to harmonize like a commune when the grid goes down. CERTS software is embedded in devices such as the Tecogen’s 100 kW CHP unit, reducing the price tag attached to most microgrid control systems. In the case of SMUD, its microgrid will be fueled primarily by solar photovoltaic panels, small combined heat and power units – which generate both electricity and heat from natural gas – and zinc flow batteries. It is expected to be up and running summer 2011. Eaton, Cleveland, OH - Entered the microgrid market in 2011. A global provider of power distribution, power quality, and industrial automation products for 100 years, Eaton received a $2.4 million stimulus grant to validate its microgrid at the U.S. Army Engineer Research and Development Center’s Construction Engineering Research Laboratory (CERL). The Eaton microgrid architecture will then be demonstrated at Fort Sill, Oklahoma. In April 2011, Galvin announced a ranking and recognition program for smart microgrid projects intended to encourage innovation in the electricity industry by emphasizing consumer needs. The program, the Perfect Power Seal of Approval™, will rank projects based on performance in the key categories of reliability, consumer empowerment, efficiency and environment, and cost. General MicroGrids, formerly Balance Energy is a San Diego-based initiative of the U.S. arm of British defense contractor BAE Systems PLC. It offers a business model tilted toward utilities, rather than end-use customers, with islanding capability often being a secondary concern. It supplies end customers with renewable energy, and packages it up into a microgrid. Balance Energy's first project is intended to be with San Diego Gas & Electric, a $212 million project aimed at providing the University of California at San Diego with its own microgrid – a self-contained electricity generation and distribution system that can serve as an island of stability amidst a wider-scale power grid. Honeywell - (NYSE: HON) Launched its microgrid business in 2010 when it was awarded a cost plus fixed fee $4.6 million contract to develop mobile microgrids for the U.S. Army Tank Automotive Research Development Engineering Center. The systems can integrate distributed solar PV as well as legacy on-site fossil generation. The microgrid will be deployed for the first time at Wheeler Air Base, Hawaii. This is a remote microgrid system that the Army claims could reduce fossil fuel consumption by 60 percent if deployed widely. In 2014 Honeywell was awarded a $3.4-million project to help improve energy security and surety at Fort Bragg, N.C. The company built a microgrid that uses advance controls to network new and existing backup generators on the U.S. Army post, the first application of this technology for a federal agency. The Department of Defense (DOD) financed the project through its Environmental Security Technology Certification Program (ESTCP), which identifies and demonstrates innovative, cost-effective technologies that address the department's energy and environmental requirements. Perfect Power System at the Illinois Institute of Technology, campus in Chicago. The Perfect Power System will allow IIT to avoid costly system upgrades and realize efficiency savings well into the future. It is estimated that the system will pay for itself as it is built, over the next five years. The project is funded by IIT and the DOE. Non-Synchronous Energy Electronics, Merrimack, NH, Specializes in sales and systems design of power electronic systems to enable efficient use of, and integration of, the power-generation applications of the future. Designs and consults for power systems using electronic AC-DC-AC power converters, and sales of the necessary equipment. These power converters are specifically designed to overcome difficult interconnection and control issues with the existing power grid as well as the supply of islanded grids. NSEE is working with Pareto Energy to develop a microgrid that avoids utility interconnection issues in a Stamford, Connecticut pilot project by only purchasing – and not sending back – power from the host distribution utility. Power Analytics - Escondido, CA- formerly EDSA Micro Corporation - Maker of Paladin® SmartGrid™ is the first commercially-available software platform designed specifically for the on-line management and control of next-generation “hybrid” power infrastructure incorporating both traditional utility power and on-premise power generation, e.g. solar power, wind turbines, battery storage, etc. It optimizes energy consumption in multi-energy source sites, whether they are focused on a single objective – such as minimizing the annual cost, carbon footprint, peak load, or public utility consumption – or a combination of objectives that vary by time, costs, energy source reliability, etc. Power Analytics supplied a models-based management continually updated according to external fuel factors (such as levels of sunlight) and internal factors (shifts in demand) to University of California-San Diego, a 42 MW state-of-the-art microgrid that is actually up and running today. Layered on top of this sophisticated scheduling platform is Viridity Energy’s software, designed to extract the greatest value for the microgrid owner according to real-time market conditions. SDG&E, San Diego, CA - Testing microgrids and intentional islanding in the small desert community east of the city. ;The Borrego Springs microgrid demonstration project has been designed to both enable more active participation by customers as a supply resource (in accommodating various generation and storage configurations), and to reduce the peak load of feeders and enhance system reliability. Borrego Springs already has a high concentration of customer-owned solar generation. SDG&E's pilot program is a three-year program of sensors, communications and control equipment, designed to incorporate these home- and business-based solar power generators, coordinate new peak load management technology, leverage smart meters and remotely control distributed generation storage devices to allow access to electricity in emergencies-in essence, the ability to "ride through" an outage. Batteries will also be installed on homes with solar panels, to aid in filling the gaps in power supplied from the panels during the day. These smaller batteries could also feed emergency supply back to the grid for short periods when needed. In addition to microgrid technology, the Borrego Springs project will explore numerous technologies, from battery storage to fuel cells, to balancing load on a circuit-by-circuit basis. Viridity Energy Philadelphia, PA - The Viridity Energy VPower™ system is a technology platform that transforms a customer’s portfolio of buildings and optimized supply and demand-side energy resources into a 24/7 virtual power plant. Viridity's software, designed to extract the greatest value for the microgrid owner according to real-time market conditions is part of the University of California-San Diego, a 42 MW state-of-the-art microgrid. It is layered on top of a Power Analytics supplied models-based management system.